Our high-performance vinyl fence systems are recognized for their long-lasting durability and beautiful design. The perfect blend of elegance, strength and performance, these classic designs provide the long-lasting beauty and charm that is only found in professionally manufactured vinyl fence systems. Available in Open Picket, Privacy, Semi-Privacy and Ranch Rail options, we have the perfect design to complement your style and enhance the value of your home, property and investment. If you want an estate look, with a product that can withstand the elements and time, backed by a lifetime warranty- look no further! Enhance your outdoor oasis with a custom built PVC Vinyl fence by our highly skilled and experienced craftsman installers. We can install many different unique decorative styles, colors, adornments or accessories to really give your fence the statement you are looking for. Our staff has been on the forefront of the vinyl industry since its inception, making our technicians the prime candidates for your quality installation. Let the experts at Budget Fence and Gate Systems find a fence to suit your style, your property, and your Budget. Our vinyl fencing is locally produced and is made from high quality virgin stock with uv protection to mitigate fading and yellowing. We also use high quality composite self-closing adjustable hinges and latches. Why Choose Decorative PVC Vinyl Fencing? There are many practical uses for a PVC Vinyl fence: To provide privacy, demarcate property boundaries, safely corral kids and pets, and prevent unsupervised dips in a swimming pool. But the right fence also makes a strong aesthetic statement, dramatically improving a home’s curb appeal. Vinyl fencing is an easy care alternative to wood and other fencing material options. A vinyl fence won’t warp, split, rot, or blister so it never needs sanding or staining or painting. Surface dirt and debris wash away easy with a periodic spraying from a garden hose. Sometimes it’s just all about the appearance: Everyone shares the American dream of owning a white picket fence. Vinyl fences provide a look that can deliver the charm and character of a wood fence without the maintenance, and long term replacement costs. The technology of vinyl product manufacturing has been elevated to offer an abundance of styles, colors, and textures, to resemble natural wood fences. Many people wisely choose Vinyl fences or Vinyl gates to help keep their children, family and friends safe around the home swimming pool. This is of the utmost importance. They do not replace proper supervision of children, but together, many unnecessary accidents can be prevented. An installation of a pool safety fence or gate can provide a great sense of security, and the design can greatly enhance the look of a pool area. With the use of artistic, decorative and architectural accents, a vinyl pool safety fence looks spectacular. It can also provide valuable privacy to a swimming area, or backyard for your family’s entertainment. 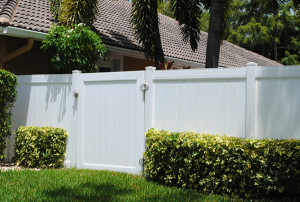 The clean lines and elegance of these types of fences can instantly raise the real and perceived value of any property. Our vinyl fencing is locally produced and is made from high quality virgin vinyl raw material stock with uv protection to mitigate fading and yellowing. We also use high quality composite self-closing adjustable hinges and latches. Our custom installed vinyl doesn’t splinter, has no sharp edges, or nails making it a great option for children and pets. We install our posts, rails, and pickets by utilizing a concealed fastening system that internally secures our fencing material components together. This method greatly improves the look, and strength of your fencing project. By eliminating external brackets and screws that are unattractive, less durable, accumulate rust stains, and dirt/debris around them, you greatly enhance your finished product. Beautiful decorative designer driveway gates also make a style statement. Trendy, or the old world look of driveway gates can have many intricate designs or patterns- they can be opened either manually or electronically automated with gate operators for access control. If you can dream it, we can custom build it. All of our PVC Vinyl gates are welded at the corners to give a picture frame finished look, which is much more attractive and durable than the alternative of pieced together and bracketed gates. 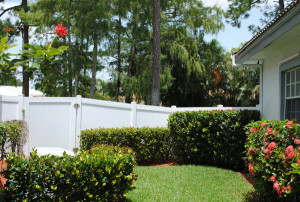 Don’t sacrifice the integrity of your most utilized and trafficked area of your fence with less than the best quality. 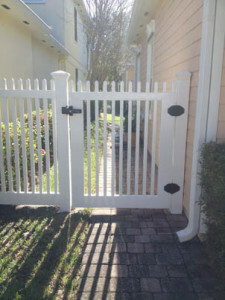 Know one enjoys the added expense and annoyance of service calls and adjustments on improperly installed gates. Meet with one of our knowledgeable project design consultants to assist in carefully considering your choices. Our experienced project design consultants can meet with you to discuss any design elements you wish to incorporate into your installation. We will listen to your ideas, needs, or concerns to provide a comprehensive plan of action to accommodate them. Throughout this process, we can provide pictures, installation techniques, and recommendations as a solution to your project. Our project design consultants are trained to address pool code compatibility, grade and elevation changes, and unique scenarios with your individual property. If you follow our recommendations, you’ll be looking at that fence- and enjoying it for many years to come. Our highly skilled, trained, and experienced installers can meet with you at the commencement of your installation to go over specific details you’re looking to accomplish. We have specific experienced installers, trained and dedicated exclusively for installing our PVC fencing line to ensure you’re receiving the most consistent practices available. We go the extra mile, to install only the best in self closing hinge hardware- D&D Technologies with every gate opening unless otherwise requested to use standard closing hardware. Each of our custom installed PVC Vinyl fence solutions are constructed piece by piece on the job site. Committing to this methodology ensures our installations will not only be aesthetically pleasing- but they’ll also stand the test of time. We are a proud member of the American Fence Association, with one of our employees having served as the president for the association. With every PVC Vinyl fence installation we provide, we follow the guiding principles of this organization for best industry methods and practices. We also incorporate our decades of experience, to know what methods of installation have the best and most proven track record for Southern Florida more specifically. 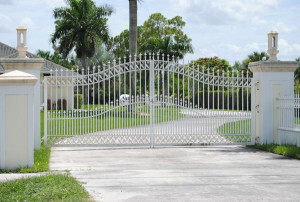 If you are looking for any type of decorative ornamental aluminum fence, gate, service or repair in Palm Beach, Martin, or Broward County, Please call Budget Fence and Gate Systems at 561-793-6404. West Palm Beach, Boca Raton, Boynton Beach, Delray Beach, Jupiter, Lake Harbor, Lake Worth, Loxahatchee, North Palm Beach, Palm Beach, Palm Beach Gardens, South Bay, and Wellington.